When a real gas is subjected to adiabatic expansion process, where no heat is exchanged with the surroundings, it looses its temperature. This cooling effect of gas expansion is known as the 'Joule Thomsone effect'. This is even applicable to real gases when the Z factor or compressibility factor is used. So even for real gases, temperature is directly proportional to the gas pressure. Naturally, when pressure of a gas is reduced without any exchange of heat with the surroundings, it tends to cool down. But how to prevent any exchange of heat in practice? Practically, this is done by throttling the gas across an 'expansion valve' or 'JT valve'. The key factor in throttling is - rapid expansion. If the gas pressure suddenly drops down, it does not get sufficient time to absorb heat from the surroundings. In most cases insulation material is also used to prevent heat ingress. Throttling or rapid expansion of a real gas across a valve tends to cool it down. 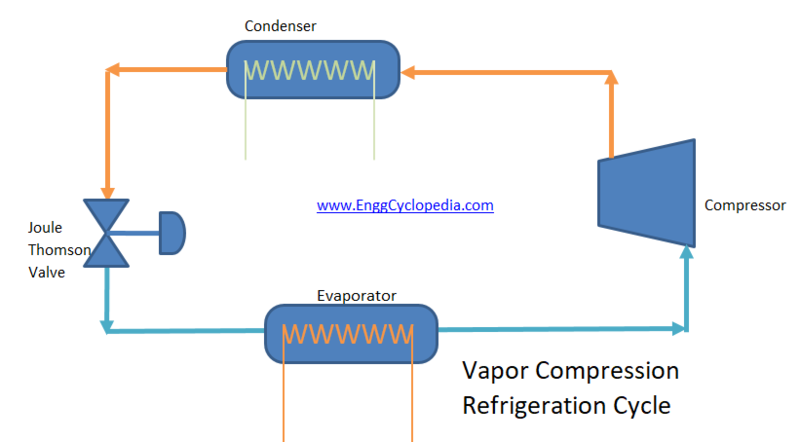 This Joule Thomson effect is exploited in vapor compression refrigeration cycle. Refrigerant is compressed to elevate its pressure, typically using a positive displacement compressor. This compressed gas is sent to a condenser to de-superheat and condense it to a liquid. The compressed and condensed refrigerant is throttled through an expansion valve, also known as JT valve for Joule Thomson effect. Rapid expansion across the JT valve cools down the gas. The cooled refrigerant gas is sent to a heat exchanger where it can be used to cool down other fluids such as, air, water or other services. In this process, the refrigerant itself gets heated. It is then collected and sent back to the compressor from step1. This way the refrigeration cycle continues.